The Kumiai (also known as the Kumeyaay or Diegueno) are an indigenous Native American people group who live on 13 federally recognized reservations in San Diego,CA, as well as 5 communities in Baja California, Mexico. 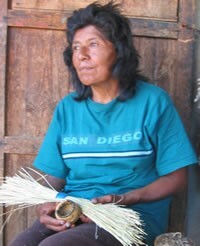 Traditionally, they were hunters, gatherers and fishers who inhabited coastal, inland valley, and mountain regions along the present-day Baja California border region with the United States. Their traditional territory originally extended from around Escondido in California to the northern part of the present day municipio of Ensenada. Occupying the southern section of present-day San Diego County in California, they inhabited the region near the San Diego Presidio when it was founded in 1769. They in the vicinity of San Diego were also referred to as the Diegueño by the Spaniards. Their primary languages are Spanish and Kumiai and their primary religion is Christianity. Pray for Kumiai to experience a personal relationship with the living God as revealed through Jesus Christ. Pray for evangelical Christians to minister to the felt and spiritual needs of the Kumiai.